Lady Gaga will play double duty this awards season: She's been chosen to perform a David Bowie tribute at this year's Grammys, the show announced on Tuesday. 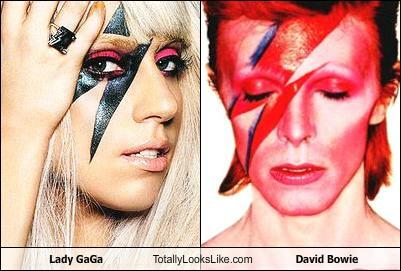 Producer Ken Ehrlich says that Gaga had already been booked to play the show, but after Bowie died, the Grammys looked to the singer who has long named the Starman as her greatest influence (even dressing as Ziggy Stardust during her Fame days) to honor him. Nile Rodgers, who produced 1983's Let's Dance, will serve as the tribute's musical director. The performance has been described as an "unprecedented, technology-infused Grammy moment" in partnership with Intel and will cover at least three or four Bowie songs. "It's going to be a true homage to who David was, particularly musically, but not ignoring his influence on fashion and pop culture in a broader way," Ehrlich says. Bowie will also receive a posthumous Lifetime Achievement Award at the ceremony. Tributes to B.B. King and the Eagles' Glenn Frey are reportedly also in the works. The Grammys air February 15; later this month, Gaga is set to perform again at the Oscars, where she's up for Best Original Song. Let the Gagaissance continue!